Guard official. The tests also cast doubt on earlier assumptions about the performance of the mid-deck tanker design. Chief, Vessel Inspection and Docu- mentation, U.S. Guard, and a mem- ber of the Tanker Design Commit- tee of IMO, the final tests conducted at DTRC have cast doubt on the committee's earlier assumptions about how much oil will flow out of a mid-deck tanker on initial impact. Earlier, the theoretical mid-deck design had been touted by the com- mittee as an environmental equiva- lent of the double hull. Coast Guard to "unequivocally re- ject the mid-deck as equivalent." The Oil Pollution Act of 1990 mandates that all tankers operat- ing in U.S. waters be equipped with double hulls by 2015. 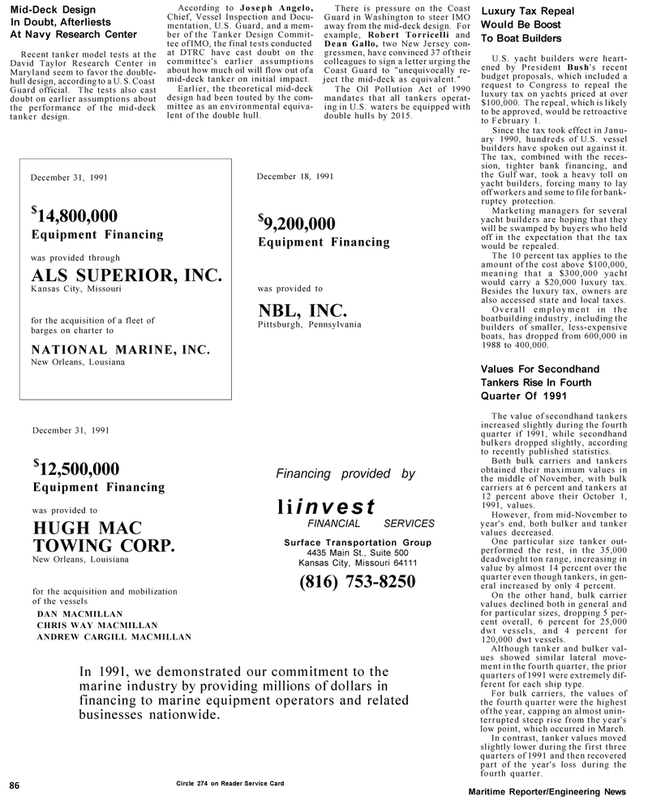 In 1991, we demonstrated our commitment to the marine industry by providing millions of dollars in financing to marine equipment operators and related businesses nationwide. U.S. yacht builders were heart- ened by President Bush's recent budget proposals, which included a request to Congress to repeal the luxury tax on yachts priced at over $100,000. The repeal, which is likely to be approved, would be retroactive to February 1. Since the tax took effect in Janu- ary 1990, hundreds of U.S. vessel builders have spoken out against it. The tax, combined with the reces- sion, tighter bank financing, and the Gulf war, took a heavy toll on yacht builders, forcing many to lay off workers and some to file for bank- ruptcy protection. One particular size tanker out- performed the rest, in the 35,000 deadweight ton range, increasing in value by almost 14 percent over the quarter even though tankers, in gen- eral increased by only 4 percent. On the other hand, bulk carrier values declined both in general and for particular sizes, dropping 5 per- cent overall, 6 percent for 25,000 dwt vessels, and 4 percent for 120,000 dwt vessels. Although tanker and bulker val- ues showed similar lateral move- ment in the fourth quarter, the prior quarters of 1991 were extremely dif- ferent for each ship type. For bulk carriers, the values of the fourth quarter were the highest of the year, capping an almost unin- terrupted steep rise from the year's low point, which occurred in March.